Precision MaxView Digital Bathroom Scale Giveaway 1- Winner Holiday Contest and Sweeps recently had the pleasure to review the EatSmart Precision MaxView Digital Bathroom Scale from EatSmart. 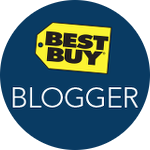 Along with a great group of fellow blogs, we are pleased to bring you this giveaway to give you a chance to win one of these terrific scales. Keeping track of your weight is vital for your health , especially if your a diabetic like myself. This scale gives you a large 4.5" LCD display, which is one of the largest that you can buy anywhere. The display is also back-lit which makes it very easy for viewing in any room and lighting availability. 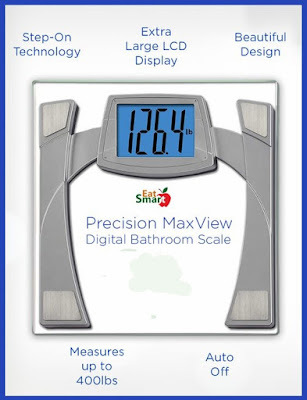 The EatSmart Maxview Digital Bathroom Scale is the ideal way to track your weight loss quickly and easily. EatSmart's proprietary "step on" technology allows you to simply step onto the scale and in seconds you'll have an accurate readout to the nearest .2 lbs on the EatSmart's oversized 4.5" LCD display. No more "waking up" your scale by tapping or pressing buttons! The LCD display also contains a cool-blue backlight, allowing for easy viewing even in the most low light areas of the bathroom or home. With EatSmart "Step-On" technology, there's no need to tap and wait for the scale to calibrate. Just lay your scale on a hard, flat surface and step on. Within seconds, you'll see your weight displayed. Once you're done, the scale activates an auto power-off feature to preserve the battery. 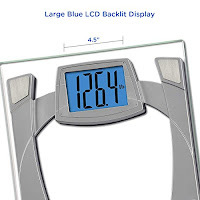 Designed to accent any interior environment, this scale features a wide, lightweight aluminum base accented with a black, non-slip plastic cover for user safety. The EatSmart scale adds a modern look to any bathroom. Its large, 4.5-inch LCD screen is illuminated by a cool blue backlight for easy viewing--even in the most dimly lit areas. 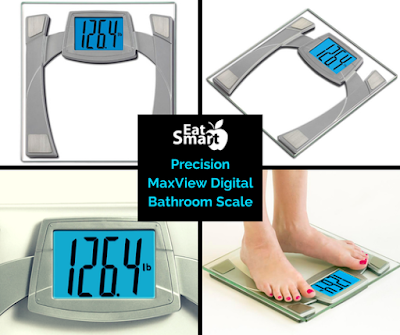 The EatSmart MaxView Digital Bathroom Scale is covered by a manufacturer's limited two-year warranty. 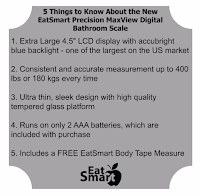 The Eat Smart Precision Maxview Bathroom Scale is by far the best bathroom scale on the market today. I am a diabetic and making sure you keep track of your wight right down to the tenth of a pound is crucial. This Scale gives you exactly that. With it's large LCD Blue readout, it's is a life saver when you sugar levels mess with your vision, making it hard to read lesser Scales at any time of the day. this will never be the case with this scale since it has one of the largest readouts on the market today. 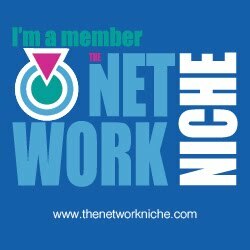 This giveaway is in no way endorsed, associated or affiliated with Facebook, Twitter or any other Social Media Networking Site. This giveaway is valid only in the Continental United States and must be 18+ years of age to enter.This giveaway will come to a end at 12:00 AM (EST) 7/26/16.